I don't usually review podcasts on this blog, but this episode of Conversations from the Pale Blue Dot is absolutely worth a listen. It is probably best characterized as a causal discussion about the respective worldviews of Christian theism and metaphysical naturalism, but with a much lower level of animosity and significantly higher level of philosophical rigor than one can reasonably expect from a formal debate. The two interlocutors go back and forth, discussing sundry topics and questioning each other freely and spontaneously. I'd prefer to hear more debates adopt this format, at least for 20-30 minutes following the opening statements. Freethinker and civil rights activist Wendy Kaminer makes a clear and cogent argument for untrammeled free speech, while Femi Otitoju makes the consequentialist argument that hate speech leads to more hate and invariable more hateful and hurtful actions. Strong arguments presented well from on both sides, on a vital issue which should be of interest to all right thinking people. Alas, it is a rather short debate (didn't even last for my entire one-way commute) but certainly it is well worth the time. This debate flows primarily from a difference of opinion regarding what the word 'morality' should be taken to mean. Predictably enough, the atheist believes that morality is an instrumental package of norms useful for humans to get along and thrive on Earth, while the theist believes that morality is a set of transcendent truths which exist in a supernatural realm accessible to us only by mystical experience or divine revelation. They each make their respective cases reasonably well, but for the most part they are talking past each other about different ideas. Both speakers are notably jolly and upbeat, which is a nice change of pace. Possibly this is the most friendly debate I've seen since the one at UCO back in 2003. I'm sure that I've never heard someone accuse atheism of the 20th century genocides in such a friendly and deferential manner as Fr. Jacobse. On a side note, the video production values on this are through the roof for a student-produced YouTube video, which bumps my rating up just a bit. Alvin Plantinga leads with the idea that naturalism does not entail the observation of fine-tuning in the universe, whereas theism makes fine-tuning probable. I have to point out here that (as brilliant as he is) he gets this perfectly backwards. On naturalistic monism, observers cannot possibly exist unless at least part of some universe is so finely tuned as to allow for them to evolve naturally. On theistic dualism, observers exist as minds entirely apart from any sort of fine-tuned cosmos which might allow for the possibilty of organic matter walking about and pumping blood to their brains. In short, naturalism necessitates the observation of fine tuning, if naturalism is true and any actual observers exist at any time and place in any universe. By contrast, theism is not linked to fine-tuning at all, unless we include the downright bizarre premise that the god of theism is a bit of a deistic chap, and prefers to create a seemingly naturalistic world which runs all by itself according to fixed natural laws. That aside, Plantinga came on the show not to confuse the listeners about cosmological fine-tuning, but rather to confuse them about the relationship between metaphysical naturalism, evolution, and the probability of some animals evolving reliable cognitive mechanisms. This he does quite well, by repeating the startingly claim that animal behavior is causally unrelated to animal beliefs about the world. Why does a cat or a dog or a human jump back and start pumping adrenaline when confronted by, say, an angry mama grizzly bear? Surely it is not because they believe themselves to be in danger. It must be for some other reason driven by neurology alone, without any regard to subjective experience. This decoupling of subjective experience and beliefs from behavior is the sort of thing that only a philosopher would dare to do, as it runs completely contrary to our actual experience of how these things really work. Enough ranting. This was a reasonably good introduction to the evolutionary argument against naturalism, and one which I'd recommend if only because one is bound to run across this argument from time to time. This panel debate (YouTube) is unique in several ways. Firstly, it is bilingual, with direction and narration in Spanish, and substantive debate in English. Secondly, it features three men on each side but only gives each one a few minutes at a time to make an argument. Thirdly, the speakers talk in front of what appears to be the world's largest 1980's themed screensaver including flying polygons. Finally, the lectern is in a boxing ring. No, really, an effing boxing ring. Evidently the Mexican version of TED talks have quite a bit more flair than the sober lectures they do here in the Estados Unidos. Matt Ridley leads off with a decent joke which doesn't translate well to those unfamiliar with the idiomatic English meaning of "recreational area" and then briefly makes the case for emergent order as opposed to top-down design, in both society and the biosphere more generally. Craig, as per usual, makes the case that purposes which don't last forever just aren't worth having, that if we don't have a holy being to obey and worship forever, then everything must be meaningless. Evidently, he values servitude so much as to make it the end all be all of human existence. He goes on to (somewhat idiosyncratically) define "evil" in strictly theistic terms and then smoothly equivocate by claiming that atheist must therefore claim that there is no evil in the world, in the ordinary sense of the term. Clever rhetoric, to be sure, but as a philosopher he has to know better than to think this is a valid mode of argument. Finally, he briefly lists his usual five arguments for theism. Shermer wastes some time upfront by talking about wishful thinking and the prosperity gospel, but then gets into his own case for purpose in a naturalistic world. He lists a few purposes which available to ordinary people leading ordinary lives without the hope of eternal life, and he does so fairly well. He might ought to have pointed out that most people spend the vast majority of their lives pursuing such ordinary purposes, rather than grovelling at the feet of their favored deity. Wolpe argues that the debate ought to be about whether the universe as a whole has a purpose, and suggests (without a hint of embarrassment) that the purpose of the entire cosmos and its billions of galaxies and quadrillions of stars was to eventually produce people who will come to know and worship the God of the Hebrews, which just happens to be the his personal area of expertise. He does have one memorable line, though, in which he says that one might say the universe has purpose in the sense that the kitchen has a meal, that is, it has all the ingredients needed to create purposes. True, and what is more, a decent summary of the thrust of Shermer's talk. Dawkins leads by insultingly comparing the opposing panel to children who have never grown out of the having of believing that everything can be explained in terms of what purpose it serves. He then gets into the nature of designed objects, which have a given purpose, and designoid objects, which merely seem to have one. At one point he accidentally gives away the farm by calling natural selection a "brilliant process" which makes it seem purposive, unless he meant "brilliant" in some sense more about luminosity than intelligence. Overall, he makes a decent case that we can explain everything in the universe without resorting to any universal purposes, especially with respect to living things. They then go into rebuttal period, in which it becomes clear that the theistic bench has put somewhat more time into teamwork and planning so as to create a flow between their arguments with little overlap. Nevertheless, both sides have a go at the other side, and as usual, Craig is polished and precise, while Dawkins is scathing and condescending. Overall, this is a must-see debate, no because of the substance so much as the style. I personally prefer dry and cultured Oxford style debate, but as they say, en la variedad está el gusto. 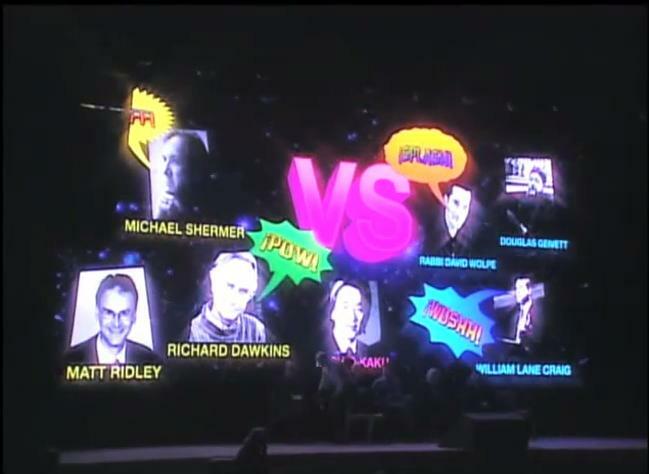 IQ2 panel debate - Is Britian becoming anti-Christian? While this debate will primarily interest citizens of the UK, I recommend it for everyone, because the challenges faces by Britian now will eventually have to be met by other socieities in the process of secularising. Focuses on specific examples of Christians being disallowed special exceptions from laws of general application in Britian. Makes the case for equal treatment, and argues that Christians often think the are being persecuted by the state whenever it is merely "insuring that idiosyncratic and bigoted Christians don't bash gays and other minorities at the public expense." Makes a witty and humorous case that Christianity singlehandedly civilised pagan Britian. You can tell he is an effective author and that he wrote all his comments out in advance. Leads off with a few quips and then launches into an argument for general non-discrimination on ethnic, racial, and religious grounds, and for the historical degradation of this principle on the part of the established churches. "Bashed indeed. We gays know something about being bashed." He ends with "Give them the tolerance that they would never give you, but give them not an inch more." His is the most persuasive speech of this debate, IMHO. First he humorously mocks his opponents, and goes on to lead the audience in prayer and exhort them to humlity. From there it gets even more bizarre. This benedictine monk makes an argument which has to be heard to be believed. He asserts that Britian is a generally tolerant place, and not to worry overmuch about the increasing diversity of thought and belief. The listener can safely skip past the Q&A period, which was most often either pointless or embarrassing (or both) and move on the closing statements at 1:33 or thereabouts. This debate provides Americans with a glimpse of the rearguard action that Christians will invariably mount in the face of increasing societal and political irrelevance, which we've already seen here in popular works such as this one. Hitchens makes the usual case that the vicissitudes and suffering on Earth make far more sense on naturalism than on classical theism. He also appeals to certain historical persons and ideas, as is his wont. I didn't find anything particularly striking about how Hitch makes his case, but I've seen him so many times now that it's all starting to blend together, and since there is no evident structure to his rhetoric it is difficult to summarize. At this point, I would challenge anyone to create a formally valid and sound argument using only lines from Hitchen's opening statements, in any order. Seriously, I don't think it can be done. Dembski does his usual tutorial on intelligent design, and goes on to make the argument that if there is no divine lawgiver then there cannot be any "objective" values that matter at all, to anyone, anywhere. By objective, presumably he does not mean that which is the property of an object (thing) rather than a subject (mind), since only minds can even ponder moral propositions, much less have ideas about which moral statements are true. He must mean "non-human" values, but those don't sound appealing to anyone. Perhaps he means "divine" values, in which case he is simply begging the question. He also makes a few other question-begging arguments, such as God is good because "good" means whatever God wants. At this point, I can imagine the schoolchildren in the audience sending little "ROFLMAO" texts to one another. As usual, Hitchens excels in rebuttal. "Morality doesn't come in tablet form" is only one of many memorable quips. The Q&A was acceptable, but overall I found this to be a wearying debate, and isn't worth seeing unless you are somehow unfamiliar with the ideas of these two debaters.